Wednesday morning, I’m driving to work. The weather was misty and rainy the day before, plus new snowfall today. And downhill drives + ice + ice + snow + ice = sliding to a stop, on my way toward a major intersection. Only, I didn’t stop on my own. I hit another car. You could call it a “fender bender,” but it definitely crunched the front of my car. If you’ve never been in an accident, it’s awful. Your nerves get all riled up, your hands shake and you have to work really hard to figure out what to do next. It’s an emotional rollercoaster. The whole 200 feet I slid (if not further), I was gaining no traction from my wheels, nothing. I knew by the last 15 feet that I was going to hit that car. He was stopped at the light, and I had nowhere to go with my car — no median, nothing. It’s an awful feeling knowing that your accident is going to mess up someone else’s day, knock them out of their routine, or worse — injure them. Luckily, everyone was safe. And the man in the other car was incredibly nice, very forgiving, and he put up with me repeating myself, “I have full coverage….I have full coverage….” Because nerves and rambling. I hated it. I damaged my own car. I damaged someone else’s. I put a dent in his car and his day. Over the phone, my insurance lady reassured me that everything was fine, it wasn’t the end of the world and that everything would be taken care of. Bless her, calming me down like that. So here we are: the same crunched car that ate $800 the week before. It’s fine. Even in the midst of the accident, I was reassured by three things that I knew to be true. Though money is simply a tool, the “need” or “have” of it can affect your response in an emergency. For me, I was able to be calm on many fronts, knowing that the accident wasn’t going to sink me financially. 01 | Get car insurance you can rely on. 02 | Keep early debt repayment plans flexible. 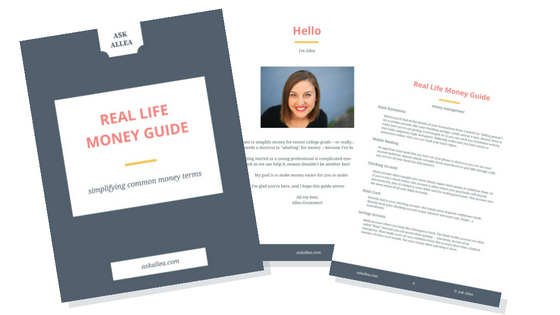 03 | Have a fully-stocked emergency fund. Background: I’m an incredibly accident-prone person. The day I got my new car, I also got full coverage vehicle insurance. Full coverage is more expensive — you pay a little more for a premium to be protected — but, for Accident-Prone Allea, full coverage insurance is worth its weight in gold. My car loan did not require that I have full coverage (though many do), but I went for it anyway. I’ve never felt so safe financially than to know that if I got in an accident, the expenses to cover damages would only cost me my $500 deductible. So, $500 out of pocket for the deductible, and the rest taken care of by insurance? Worth it. They covered my car being towed (that’s right, that baby was immobile), plus my coverage included a rental car at the expense of the insurance company of up to $30 per day for 30 days. So now I’m driving a little zippy Nissan Versa Note for a while, allowing my life to resume as normal. Ultimately having great coverage reduces my anxieties. That’s what insurance is for: to cover you for when the unexpected happens. I don’t have to worry about paying for the repairs to my car out of pocket. I pay a deductible, and that’s it. I like making plans, and that includes my debt repayment. I’ve got student loans, and I’m trying my hardest to pay them off soon. The goal is to pay my loans off in 16 months. To do that, I plan to put $550 each month toward my loans — $170 is my minimum monthly payment, plus the rest going toward extra principal payments. However, my accident this month reminded me of how grateful I am that I only have a $170 minimum to pay. Though I would love to still use that additional $380 budgeted for my student loans, it doesn’t make sense when an accident happens. I’d rather put that toward my car maintenance bills and/or my insurance deductible this month, take care of those bills and move on. I’m calling this month a wash when it comes to debt repayment. And that’s okay. I’ll start fresh next month, once my car expenses are done and taken care of this month. There will be a time when you have to spend money on things that are less awesome than you’d like: like an insurance deductible. Sometimes being an adult means you can’t get everything you want. And if that means my debt doesn’t get paid off until one month later than I’d hoped — it’s not the end of the world. Y’all, an emergency fund is for emergencies. Sure, it’s your savings account. And sure, it’s right there “if you need it,” but it really shouldn’t be something you’re dipping into — like, ever. Unless of course, you know...there’s an emergency. I’m a firm believer in letting that money sit there. Pull big, unexpected expenses from within your monthly budget if you can. Much of what we think are “emergencies” are really costs that we should be expecting. Because a lot of things cost money on a regular basis — hmmm, like, cars. I roll over my monthly car maintenance budget every month. I know for a fact that my car will cost me money. The question is how much and when. And since I can never know those things, I save up $40-50 per month (though my mechanic says to save $100 each month), knowing that I’ll need an oil change, new tires, brake pads a new battery, etc. I won’t know when I’ll need these things, but I know they’re coming. Thus, they are not emergencies. Be proactive and save up as much as you can. For the $800 maintenance to my car this month, almost $400 of that was saved up from months prior. I only had to find the other $400 within my monthly budget (ultimately, from my budget for extra student loan payments). It’s that $500 deductible that needed to come from my emergency savings, only because I can’t find that much money in my monthly income to cover it otherwise. I haven’t touched my savings account since I paid off a huge chunk of my car loan last year (oh, the irony). However, I know I need to have enough in my savings to cover my deductible for my car, as well as plenty of cushion for if anything serious happens and I need to pay for medical bills. An emergency fund dollar amount isn’t an exact science. For me, the amount to have in my savings account depends on what allows me to sleep at night. I know I need more than $1000, so I lean more toward having $3000-$5000 socked away, just in case. If you can, stock up a savings account of 3-6 months of your take-home pay. That’s the big goal. It’ll take awhile to get there, but little by little, you’ll see how helpful it is to have money available for if an accident happens and life requires you to pay up. You’ll feel better about spending that money when you understand what your car needs and have trustworthy people to take care of the work itself. Are you financially covered in case of a fender bender or larger car accident? P.S. And yes, this smooshed-up CRV is the same car I paid off within a year of buying it. Hilarious, right?